Design work on a twin-engined light transport started in 1946 with the MD 303, a development of an earlier project for an eight-seat communications aircraft the Marcel Bloch MB-30. The prototype MD 303 first flew on 26 February 1947 powered by two Béarn 6D engines, designed to meet a French Air Force requirement for a colonial communications aircraft. A re-engined version was ordered into production at the new Dassault factory at Bordeaux-Mérignac. The production aircraft was a low-wing monoplane with twin tail surfaces and a a tri-cycle undercarriage and powered by two Renault 12S piston engines. Three main versions of the aircraft now named Flamant (means Flamingo in French) were produced. The MD 315 10-seat colonial communication aircraft (first flown on 6 July 1947), the MD 312 six-seat transport aircraft (first flew on 27 April 1950), and the MD 311 navigation trainer (first flew on 23 March 1948. The MD 311 had a distinctive glazed nose for its role as both a bombing and navigation trainer. The aircraft was used for pilot training, transport, maritime surveillance and bombing. During the Algerian War of Independence the plane was used for light attack with SS11 missiles or with machine guns, bombs, and rockets. The Flamant stayed in service until 1981. 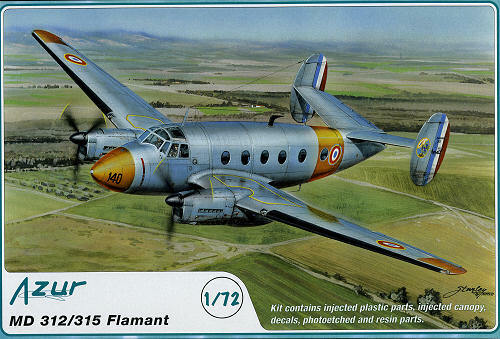 In addition to the French air force, the Flamant served in Cambodia, Madagascar, Tunisia, and Vietnam. Another interesting kit from Azur. They usually concentrate on French subjects and this is one that I'm quite pleased to see kitted. The MD312/315 was seen all over the place in the 1950s-1970s. Some were in dedicated transport units and some were station hacks. Many had large international orange bands n them that were quite colorful when the paint was fresh. This kit is quite typical of the MPM family of short run kits. There are resin parts and a few photo-etch as well. Thankfully, most of the vac canopy kits are done and this one has injected clear plastic for those bits. The kit includes the 'glass' nose and extended wing tips of the MD.311 so an adventurous modeler will be able to kit that one as well. Probably going to be another boxing just for that version. Molding is quite good with no real problem areas to speak of. The resin parts are for the interior chairs, engine fronts, exhaust and a few small scoops and other outside bits. Photo etch is used for the instrument panel and seat harnesses in the cockpit. There is also an acetate piece for behind the panel. Instructions are quite nicely done with lots of well drawn construction steps and a few detail drawings to help out. Thanks to the solid nose, there is lots of space to pack weight as it will be needed. No optional parts on this kit as all the planes were pretty much the same. It is nice having a full cabin and the transparencies are clear enough so that you should be able to make out shapes and colors without too much trouble. Of course, color info is provided in Gunze colors as Humbrol's future was still undecided when this kit was developed. With Gunze pulling out of the US market this will be a tad of a challenge to some to get the right shades. Markings are provided for three aircraft, all in overall aluminum. 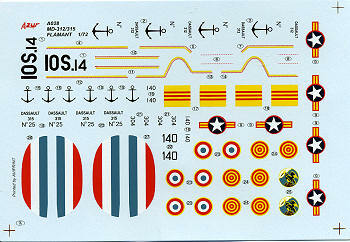 First is the box art plan from the French Air Force in 1966 with International Orange or even Daglo orange bands. Next is a French Navy version from 1960 without the orange bits. Finally, a Vietnamese plane from 1954. This one has the option of early or later insignia. Decals are very nicely printed and quite thin. So there you have it. Another interesting type that we never thought we'd see kitted. It will make for a fairly large model when done and look nice on your shelves. These sorts of kits tend to sell out rather quickly so you may want to grab one while the getting is good.